The latest tab from ROTSG has been added – Black Jaguar & Surfride. Others already online include: 1963, Mermaid Beach, Freakout, Reverb Beach & Flight of the Surf Guitar. Check back regularly for new ones. These are from CD Baby and this time they’re from people that have bought the CD. Check them out here. Guitar picks – now on sale! You can buy packs of 10 Revenge picks. More info here. The new season of Bondi Rescue has been featuring music from Revenge of the Surf Guitar. Episode 9 this week will feature Reverb Beach, Freak Out, Black Jaguar & Queen Kahuna. New tabs have been added to the downloads page. These include: 1963, Reverb Beach & Flight of the Surf Guitar. Check back regularly for new ones. 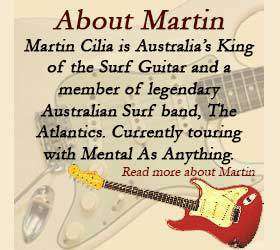 ABC TV is to replay the highly acclaimed documentary “Delightful Rain: a Celebration of Australian Surf Music” Australia Day Weekend Sunday January 27th 2008.